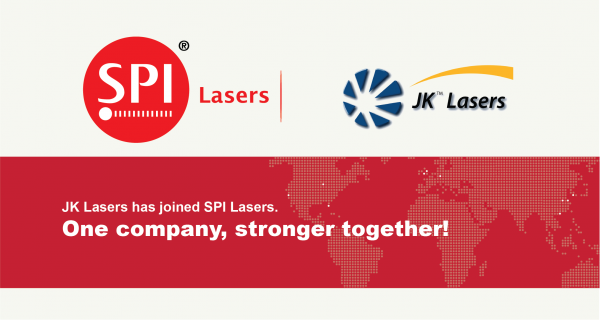 As of April 15th 2015, SPI Lasers has completed the acquisition of JK Lasers based in Rugby (UK), to enhance its high power Fiber Laser portfolio. With almost 100 employees and annual sales of 17.6 million euros, JK Lasers is one of the world’s leading manufacturers of high-power Fiber Lasers for industrial use; their acquisition helps SPI Lasers to strengthen their position as a leader in the Fiber Laser market. JK Lasers (formerly a member of the GSI Group), has more than 40 years of experience in Laser development. With its core competence being in the development of Fiber Lasers with outputs up to 4 kilowatts, as well as combiners for joining Laser sources and other beam guidance components. The acquisition will see JK Lasers, its products, offices and an additional 42,000 sq ft of floor space incorporated under the single brand of ‘SPI Lasers’, with its UK site in Rugby continuing to operate as an additional production, development and customer service centre for Fiber Lasers and optical components. It is expected the acquisition will have significant customer benefits, bringing improvements in both experience and expertise to SPI Lasers, creating a more versatile organisation, with enhanced vertical integration. It will also create an expanded base of highly qualified Laser experts; which translates into a broader product offering, greater integration, product innovation and enhanced customer service. The expanded product range will see SPI Lasers move into the field of multi kW systems, as well as utilising a number of additional JK Lasers products to enhance their levels of vertical integration. It has been confirmed that SPI Lasers will continue to support and enhance many of JK Lasers existing products, ensuring their customers continue to enjoy the same quality and ease of use they have come to expect. Customers of JK Lasers have been assured that they can rely on the same personal working relationships they have experienced in the past, dealing with the same people, delivering the same quality of work. SPI Lasers will be attending the Laser World of Photonics Exhibition later this year in Munich, where customers old and new, will be able to view the companies’ complete product suite.